It’s inevitable. Somehow, someway, no matter how many times our friends and family members say “you’re perfect the way you are”, we will always find something about our physical appearances that we wish we could change. My friend Eddie wishes he was taller. My cousin Patricia wishes she was slimmer. Heck, I wish I had more curves! But, we all can’t have what we all want. Or can we? In some cases, there isn’t much that can be done to help you. (Sorry Eddie, other than platform shoes, I’m not sure what to recommend). And in other cases, there are solutions. I think the first thing that needs to be done is to stop denying your loved ones their right to wish better themselves. I do think it’s very important to encourage those that you care about to feel confident about themselves. But as long as no harm comes to them, why shouldn’t they improve their physical appearances to gain a better sense of self overall? Take my friend Julie, for example. She – like many of us – is a complainer. For as long as I have known her, she has always been displeased with her lips. “I barely have any,” she often says. Thin lips may not be the most undesirable things in the world. But then again, they may not be the most adequate smooching devices either. Julie, at one point, insisted on getting collagen implants and was dissuaded by pretty much everyone she knew. “You’ll look like a duck,” some of her friends would say. Hey, after watching enough Hollywood news stories, it’s easy to assume plastic surgery is often the cause of horrifying features. I think, however, that without doing the proper research on the various treatments that are out there, one would imagine that you can’t look natural after cosmetic surgery. Thankfully, Juvéderm Dermal Fillers have become a proven remedy for a variety of issues including saggy skin, wrinkles, facial volume loss, ear lobe creases and yes…thin lips. The procedure takes no more than about fifteen minutes and patients are able to return to their normal activities immediately after. Patients who undergo treatments using Juvéderm fillers become the beneficiaries of a younger, smoother and refreshed look. The key, however, is how “natural” the treatments allow them to appear. I know that one of Julie’s main concerns is having that fake, plastic look associated with many celebrity plastic surgeries. Remember, that with Juvéderm fillers, you wouldn’t be going under the knife. 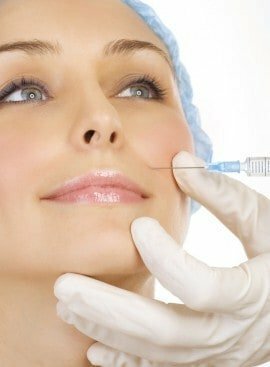 Instead, a number of injections are made over time to help generate maximum results. As always, it’s recommended you contact a licensed physician to learn more about this any other procedure that you may feel will help you look your best!